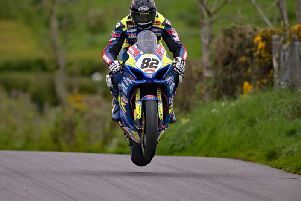 The 55-year-old’s return to racing resulted in victory over the Moto3 support class within Bishopscourt’s Ulster Superbike Championship meeting. Having opted to hang up the leathers in the early noughties following a serious crash, Coulter - bar a brief appearance in 2012 - had moved off the track and instead turned his focus to coaching. Although Coulter maintains his view that “nothing can match that adrenaline rush from racing”, his welcome comeback appearance had little connection to a world which dominated his life for decades. Instead Coulter considers it simply another step along a path towards overall satisfaction within a journey he started five years ago. “The result was irrelevant and instead I got back into racing simply to scratch an itch and prove to myself I could do it and not fall back into old habits,” said the Portadown man. “I first was attracted to racing in my late teens and knew from the first moment I got on a bike it was what I wanted to focus on. “However, over my career I had so many insecurities and was riddled with self-doubt to the point I believe it held me back. “Motorcycling gave me a level of acceptance I struggled to find in my life outside of the sport. “Once I dropped the visor I felt confident and in control and my fear after retiring was I could never find anything that mattered as much. “But everything changed about five years ago and now those negative thoughts have been eliminated and I look forward to embracing everything life has to offer. “I needed to get out and race again just to make sure I no longer had those same thoughts as in the past and woke up the next day and felt fine. “I was never as relaxed going into a race as before Bishopscourt and in the past I would have been over-analysing every aspect, now I feel able to walk away and just enjoy life. “That is not to say I will never return to racing and the idea of doing something to mark my 60th birthday holds appeal. Coulter puts his altered outlook down to learning about Dr Max Gerson and adopting a plant-based diet that he feels has transformed everything. “I heard about the work of Dr Gerson and reading everything I could then moving to a different way of eating has turned my life around,” said Coulter. “Growing up in Portadown I would be messing about and got my first fracture at 10 years old, of course, going into motorcycling only made it much easier to break bones! “I’ve had about 24 fractures over my life and that results in a lot of aches and pains, on top of a poor diet due to long hours on the road with racing or just being unfortunate enough to stay skinny no matter what so thinking I could eat anything. “Now my reactions and mental awareness are vastly improved, I’m bouncing around with so much energy and feel better than I did 20 or 30 years ago.